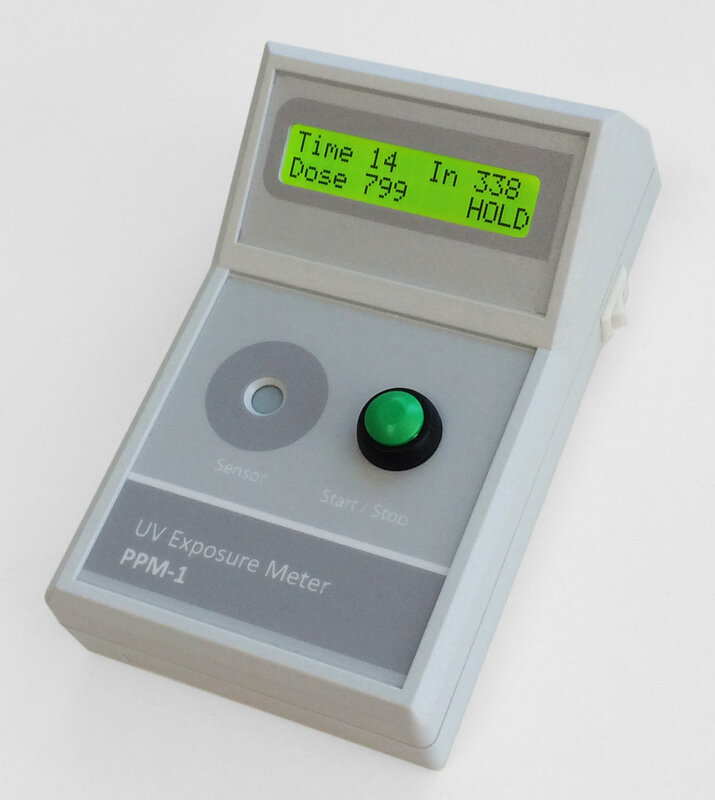 This handheld meter has an internal UV sensor, a large, easy-to-read display showing the exposure data and a start-stop button. The sensor on the unit measures only the UV wavelengths between 350 - 450 nm while not responding to visible light. As well as measuring UV intensity in this wavelength range, the meter also measures the exposure time and the accumulated (integrated) exposure dose. Measure: The display now shows the current UV intensity, the time in seconds and the accumulated UV dose since the measurement started. Hold: The measurement is stopped and the measurements are frozen on the display to allow you to record the information if you choose. A further SHORT press will return you to step 2 to allow you to continue a measurement (useful for checking progress or while making test-strips), or a LONG press (3 seconds) will take you back to step 1 and reset the meter. System: The meter consists of a digital light sensor and optical filters, integrated with a microprocessor controller. 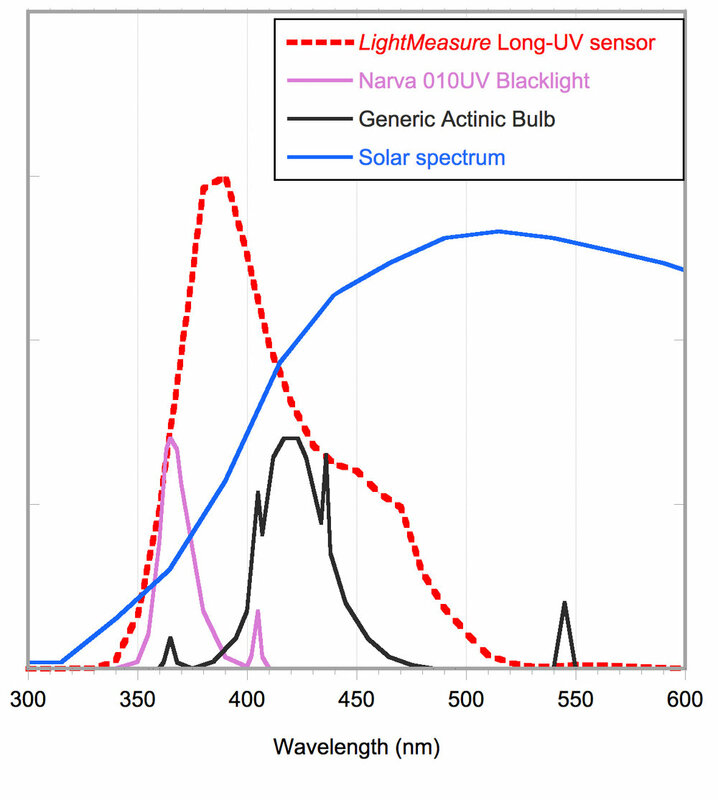 Spectral Response: 350-490 nm. Suitable for use with mercury bulbs, blacklights, Philips' Actinic 05 bulbs, generic actinic bulbs, the sun or similar light sources that have significant emission below 490nm. Exposure dose: This is the reading that will be of most frequent use to the artist. It is the total accumulated UV dose received by your print medium since you pressed the start button. 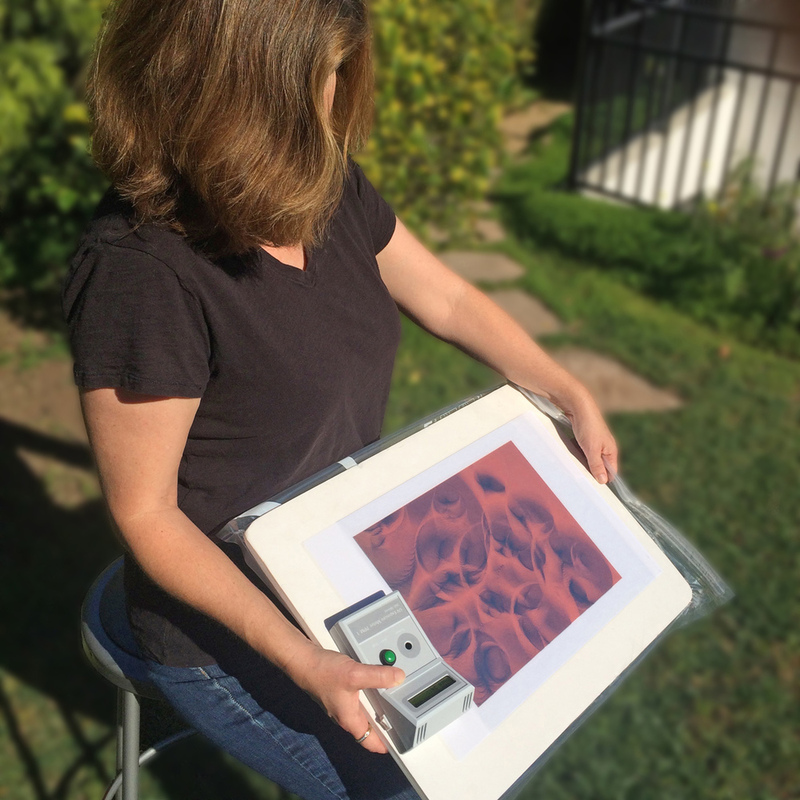 Monitoring the dose during the exposure process and stopping once you reach the 'target dose' ensures your prints always receive the same exposure regardless of the intensity of the illumination. Intensity: This reading has many uses: evaluating the intensity of ambient UV levels in the studio, measuring the relative UV transmission of materials, or comparing the UV intensity of different light sources. Time: This reading is the number of seconds since you started the measurement. Battery Operation: Operates from a standard 9V battery, which is easily replaceable without tools. The display indicates a 'Low Battery' warning once the battery voltage has dropped below 5V indicating the battery should be replaced. Sleep Mode: The meter will go into sleep mode after 5 minutes of inactivity in order to preserve the battery. Note that this will not happen if you are in the process of making a measurement. Simply press the green button to restore. Dynamic Range: The digital sensor allows the meter to work over a wide range of illumination intensities. For example, the meter can measure equally well in a darkened studio (where the intensity might be < 0.1 units), or with a very intense light source (over 5000 units). To put this in perspective, the intensity of bright midday sunshine is typically several hundred units. Linearity of Response: The PPM-1 has a very linear response over its entire measurement range (non-linearity is 0.2%). The Display: Consists of a backlit 16 x 2 green display for easy reading. The information shown is the time (in seconds since the measurement started), the current UV intensity level, and the accumulated dose of UV light received since the measurement started. Using the PPM-1 to accurately expose a photopolymer plate using the sun. The meter is easily handheld during exposures and the angled display makes for easy viewing of the exposure information. Using the PPM-1 meter to monitor ambient UV light in the studio. Note that the meter is not sensitive to visible light, only those wavelengths which might inadvertently expose your UV sensitive medium.